The Volvo Ocean Race returns to centre stage less than three months after the spectacular finish of the 2014-15 edition when it brings its special brand of exciting racing, shows and public events to the Genoa Boat Show from September 30 to October 5. The Volvo Ocean Race returns to centre stage less than three months after the spectacular finish of the 2014-15 edition, when it brings its special brand of exciting racing, shows and public events to the Genoa Boat Show from September 30 to October 5. Team SCA and Team Vestas Wind will go head-to-head again on a series of Pro-Am races on Wednesday, September 30, Thursday, October 1 and Friday, October 2, while on the following Saturday, they will be starring in the traditional Genoa Boat Show fleet race. The Genoa Boat Show will offer a rare chance out of race-time for the fans and visitors to see the ocean racers sail just metres from the city's seafront and meet some of the sailors who have written the latest pages of the race's 42-year history. Team Vestas Wind will sail in Genoa under Chris Nicholson as skipper and Nicolai Sehested as Boat Captain. Returning with Team Vestas Wind sailors to sail the Vestas Wind is local Italian sailor Alberto Bolzan, and Volvo Ocean Race veteran, Phil Harmer. Several members of the shore crew and guests, some of whom will commission the boat and sail from Alicante to Genoa the weekend prior to the Genoa Boat Show, will also accompany the team. Having reached the end of his first Volvo Ocean Race in June, young Danish sailor Sehested has been busy participating in several high-level sailing competitions, motivating him to re-join his Volvo Ocean Race crew and sponsor, Vestas, for more exhilarating sailing in the team's Volvo Ocean 65. "The experience gained with Team Vestas Wind is unforgettable - a bittersweet tale of hard work and team effort with a positive conclusion," said Sehested. "I felt proud of what we all achieved, both onboard the blue boat and behind the scenes. I have grown as a professional sailor and as a person, and I'm delighted to be going back to Genoa with some world-class sailors and friends, representing Vestas and giving something back to our Italian fans." Libby Greenhalgh, British navigator of Team SCA, will help lead a team from the women's crew against Nicholson, Sehested and the rest of the Team Vestas Wind line-up. "It will be great to be back racing again and being part of the Genoa Boat Show - attending the busiest Boat Show in the Mediterranean is a fitting way to cap off the summer," she said. "Eight crew from the Team SCA squad will be in Genoa and we are all looking forward to whatever new opportunities come our way, while continuing to promote women both in the Volvo Ocean Race and in the wider sport of sailing. 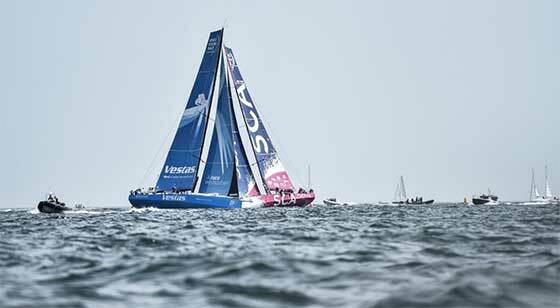 "Locking horns with Team Vestas Wind again will be one of the highlights - as well as meeting some of the Italian Team SCA fans!" added Greenhalgh. The Genoa Boat Show will also give the visitors the opportunity to visit the Cross Section, a full size, and completely equipped Volvo Ocean 65 half model. They will get a real taste of what it's like to be inside one of the world's fastest and most powerful offshore boats. The Cross Section was one of the most popular attractions during the nine-month event, which finished on June 27, with nearly half a million people 'jumping on board'. The public will also be captivated by the shows in the Dome cinema, a huge structure that hosts a movie theatre showing high definition videos on the race and life at sea. On the Saturday morning, fans will also have the opportunity to meet the sailors and the race organisers during a Q&A event at the Teatro del Mare, and on weekend days (October 3-4), the two boats will be open to the public for guided tours. The Genoa Boat show will also showcase Italian excellence in the international sail racing and marine industry. Leading the way in Genoa will be Alberto Bolzan, the only Italian sailor to take part in the 2014-15 edition of the Volvo Ocean Race as helmsman and tactician on Turkish/American flagged Team Alvimedica. Persico Marine, the Bergamo-based shipyard that was part of the European consortium that built the first seven boats, will represent the Italian marine industry. Persico recently secured a contract for the production of any new, one-design Volvo Ocean 65s that will be commissioned to compete in the next edition of the race. Also present in Genoa will be hydraulics specialist Cariboni, rope maker Gottifredi Maffioli and deck hardware producer Harken. Volvo Ocean Race CEO, Knut Frostad, said: "I'm really looking forward to meeting some of our fans at this wonderful show. Italy has always been a massive supporter of the race and we're delighted to be bringing a real taste of it to their waters." Save the date, come and meet the Volvo Ocean Race at the Genoa Boat Show from September 30 to October 5.